Contrato de opção e fundo financeiro como instrumentos de gestão de risco climático na alocação de água/Option Agreement and Financial Fund as instruments of climate risk management in the allocation of water. Option Agreement and Financial Fund as instruments of climate risk management in the allocation of water. Simulação de cobrança pelo uso dos recursos hídricos na bacia do ribeirão Taquarussu Grande, Palmas-TO/Simulation of charging for the use of water resources in the basin of ribeirão Taquarussu Grande, Palmas-TO. Simulation of charging for the use of water resources in the basin of ribeirão Taquarussu Grande, Palmas-TO. 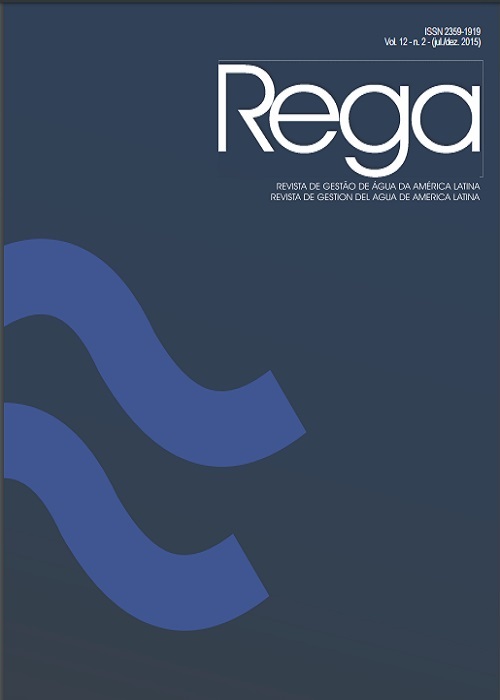 El mecanismo de reforzamiento hidrológico de los procesos de calentamiento global en Colombia/Hydrological reinforcement mechanism of the global warming processes in Colombia. Hydrological reinforcement mechanism of the global warming processes in Colombia. Atuação do Comitê da Bacia Hidrográfica do Rio Sergipe na denúncia e encaminhamento de conflitos socioambientais/Performance of the Sergipe River Basin Committee in reporting and measuring environmental conflicts. Performance of the Sergipe River Basin Committee in reporting and measuring environmental conflicts. Alocação de custos e a cobrança pelo uso da água no estado do Ceará/Allocation of costs and charging for the use of raw water in the state of Ceara. Allocation of costs and charging for the use of raw water in the state of Ceara. Application of the GOD and POSH methods to determine the vulnerability and contamination risk of aquifers in Santa Maria, a city in the state of Rio Grande doSul, Brazil. Impacto das mudanças climáticas e do uso agrícola do solo no processo hidrológico no bioma Mata Atlântica/ Impact of climate change and agricultural land use on the hydrological process in the Atlantic Forest biome. Impact of climate change and agricultural land use on the hydrological process in the Atlantic Forest biome.